The Holidays are officially here and to me one of the greatest things about the holidays is giving. Whether its giving of gifts to a family member, friend, or to a family in need everyone has some holiday shopping needs. So, why not take advantage of a shopping experience that also allows you to give back to a number of local and national charities? Metropolis Mall in Hendricks County has done just that in one fun event. This year marks the sixth year of the Shop.Dine.Give event at Metropolis, and it promises to be the best event yet. 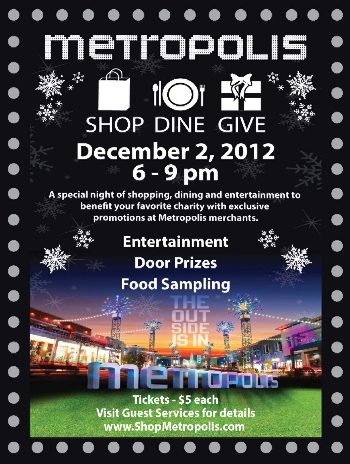 Shop.Dine.Give will take place from 6-9 p.m. at Metropolis Mall in Plainfield, Indiana. For just $5 become a VIP shopper with proceeds benefiting charities such as Mental Health America, American Cancer Society-Relay for Life, Delta Theta Tau, Churches in Mission, Susie&apos;s Place and many others. These charities among others will receive all portions of ticket sales from the evening. Not only will your shopping for the evening benefit a good cause but Marketing Director Tammy Haenlein says the VIP treatment includes perks such as: exclusive deals for retailers and restaurants, register to win opportunities, samplings and giveaways. Tickets for this event may be purchased at any of the charities listed above. For more information, visit Guest Services at Metropolis. Come out to join in the fun of this great event. Get some of your shopping done with some great deals all while giving back to local charities! Sounds like a perfect night to me!